Another week, another Molly Middleton obsession - Hermes. I love the brand and have for most of my life. My father always wore an Hermes tie and I loved them as a little girl because all of the playful patterns. I think I am attracted to the bold colors and the refinement of the brand. Everything they produce seems to be refined, timeless and distinctly luxury. 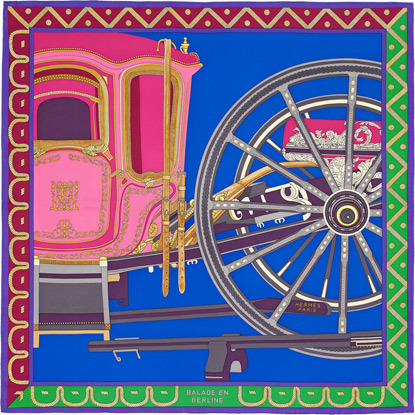 Known for the Birkin and Kelly bags as well as the colorful scarves, Hermes is an iconic brand. There is so much conversation surrounding the Birkin bag because of its incredible price tag and waiting list. But ignoring this component, the Birkin represents one of the things I love about Hermes: their commitment to quality. One of the things I encounter as an event planner is the tendency to want to pinch pennies. I advocate to my clients purposeful spending for quality. In my profession, there are many situations in which splurging pays dividends in terms of the experience. There are endless overly or exorbitantly priced items in the event world, and in the world at large. Perhaps the one justification for this kind of spending is a company or artist's true commitment to quality. Birkin's are timeless and long-lasting. The price tag is absolutely an indicator of quality. Hermes is most known for its leather and scarves but they also have incredible tableware. I found this post covering a display of Hermes 'Voyage en Ikat' china and I loved the way the collection was layered - pattern on top of pattern, not to mention the vivid colors, so I had to include it here. The ikat pattern combines beautifully with the rich purple and blue table and also with the gold flatware. 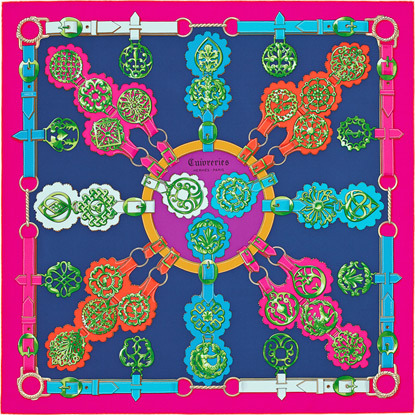 Hermes, across the board, is not afraid of color - and that's one if the main reasons I love the brand. These photos above are another example of how Hermes manages to be bold while still appearing incredibly luxe and dynamic. Anyway, the bangles, which come in many colors and finishes, are simple beautiful additions to any outfit. It would be a dream to have a bangle to wear with every outfit; but, the amazing part about the bangles (much like Hermes scarves or bags) is that in many ways -- simply as a result of it being Hermes -- you can wear it with almost anything. I had to include turquoise, of course, because it is my favorite color! Hermes is a long-respected brand but is finding ways to stay relevant - i.e. partnering with Apple on the Double Tour watch. I thought this was such an interesting choice for them. The brand is known for creating items that are highly sought after, much like the newest Apple product, so I guess its not so surprising. 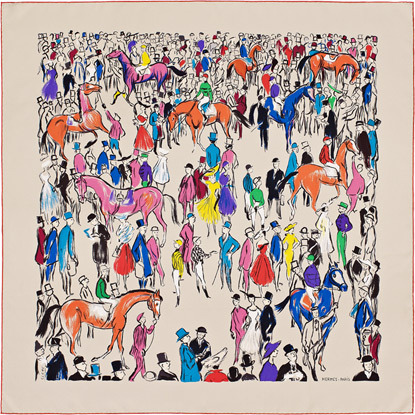 These are some of hundreds of examples of beautiful Hermes scarves (you can find more on their website) and you can see how all of the patterns are so unique and intricate. I love the vibrancy. Hermes scarves can spice up an outfit. They can add a luxurious detail to a simple look, but one less common use of scarves is in home decor. I've started to see this and I think it is so interesting to see the beauty of a scarf incorporated into interior design. Below is just one great example. I could go on and on for my love of Hermes. I covet almost everything that they create and I have always appreciated their attention to detail. In a funny way, it's similar to how I think about events: yes, sometimes it seems odd to spend so much money on a singular thing but when you invest in quality and beauty, the experience (whether of owning an Hermes scarf or the memories of a beautiful wedding) will last you longer than any inferior competitor! After the business of dinner parties and Valentine's Day celebrations, I thought this week I could slow down and talk a little more about some things that inspire me. One of my favorite things about my job is that I get to fill my world with visually appealing things. One obsession that has been on my mind lately (well, all my life really): blue and white. I love how classic and simple it is, but also how many different ways it can be used. The most common (and probably my favorite) example of the blue and white color combination is in the patterns of ceramic jars. They come in all shapes and sizes but they always add a really amazing texture to a room. One of my favorite parts of the photo above is the choice of such contrasting flower colors. It's dramatic in the most beautiful way! I love bold color combinations (if you've read my Chinese New Year post, you probably noticed) and this one is no exception! While blue and white feels at home with neutrals and muted colors, it can also hold its own with other bright colors around it. So don't be afraid to go for the bold pairings! Although my first instinct when I think blue and white is interior design, when I came upon the above picture of the outdoor planters with the mixed blue and white patterns, I was obsessed! Blue and white is such a crisp color combination so it mixes beautifully with the colors of nature. I also like the dramatic size of these planters. If only I had a backyard to fill with them! Of course, it would be silly for me to write a blog post and not have events play some role... I am an event planner after all! I pulled these two examples of blue and white ginger jars in tablescapes and I didn't realize until putting them side-by-side how great a demonstration it was of the flexibility of these jars. It is clear, though, how blue, white and green are a never-fail color combination. I love how in the photo on the left (from Splendid Sass) the oversized jars add vertical drama to the table and the warmth of the branches and the wood in the surrounding room make the table feel a little more rustic. And then the photo on the right (from Sarah Sarna) plays more on the dainty, feminine concept of the blue and white by combining the patterned jars with an equally patterned tablecloth. It is a lot of pattern, yes, but an amazing amount of blue and white! This exquisite blue and white embroidered tablecloth by Aerin Lauder is timeless. (image from Habitually Chic). I was drawn to this photo of a tablescape Aerin Lauder created at her beautiful home in the Hamptons because I saw the inspiration for the tablecloth in the jars that I have been showing. I love the design of this table with the textures of the woven placemat, embroidered tablecloth and napkins, bamboo silverware and silver mint julep cups and salt and pepper shakers. Even though there are a lot of different components, they all fuse seamlessly because no single compontent is trying to be the star. To me that is the epitome of classic: beautiful but not intentionally attention-grabbing. 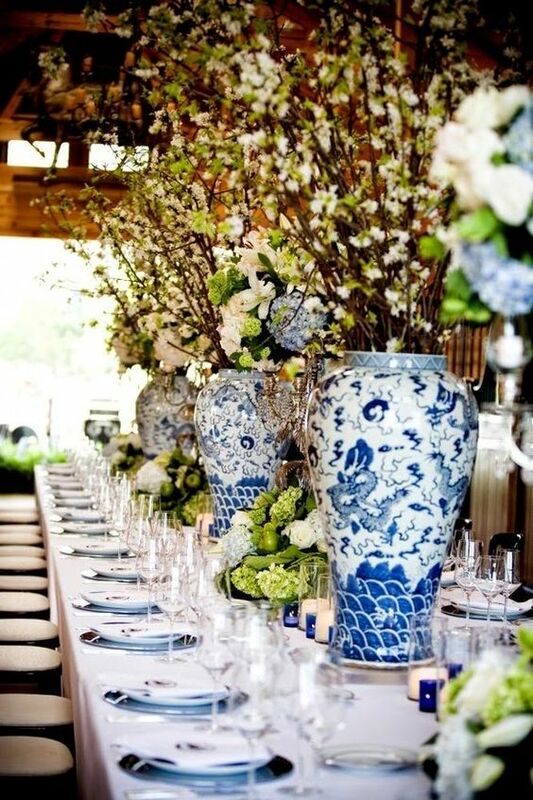 Whether it be in the form of ginger jars, table linens, planters or even in your wardrobe, blue and white makes such a statement. It exudes a feeling of comfort as well as elegance. Blue and white is a color combination that will never go out of style and it will always be one of my favorites for the home and entertaining. Having a Valentine's Day Party doesn't need to be complicated! Click to see some cute ideas for a sweet Valentine's Day parties complete with flowers, a dessert bar and a seasonal drink! Chinese New Year is not a holiday to go for muted colors or pastels. Molly Middleton Events approach to a Chinese New Year dinner party is full of personality and fun details! Click to read more! Cheers to the last hurrah of summer! We are sad to see the summer go, but thrilled for the upcoming fall season! So, we are squeezing in a last little adventure into the great outdoors of Telluride, Colorado! We are sad to leave the freedom of summer behind, but there is something in the New York air that makes fall irresistible. In preparation for the hustle and bustle of the season, we are looking to our fashion icons to pickup a few tips for our fall wardrobe. Ralph Lauren, Celine, The Row, Hermes - to name a few favorites - are inspiring us to get layered up in warm, earthy tones full of leather, fur, and fringe!! We have a personal fascination of ancient Asian inspired things. As luck would have it, The Met Museum hosts a “China: Through the Looking Glass” exhibition… Obviously, a field trip was in order. Needless to say, we were inspired by the Chinese inspired motifs, gorgeous fabrics, twisting shapes… Can we do a chinoiserie themed party next? Let me just say, Nantucket in the summer is magic. From the moment you arrive on the ferry into the harbor of beautiful sailboats, you are completely consumed by love of Nantucket. Exploring past the wharf, you walk into the preserved quaintness of an old whaling town. Beautiful cedar shake homes line the cobblestone streets with gorgeous gardens full of lush hydrangea and wild, rambling roses. The scene is out of a movie set! These days, we are into paper products. Previously, wedding invitations were simple and clean, few frills. But the times have changed, and we are on board! We love unique, colorful, intricate invitations that begin to set the stage for the event to come. Create your own look, connecting elements of your save the date to your invitation to your welcome note! Inspiration for the wedding wardrobe from Angelina Jolie in The Tourist. When designing an event, soft lighting is of the upmost importance. 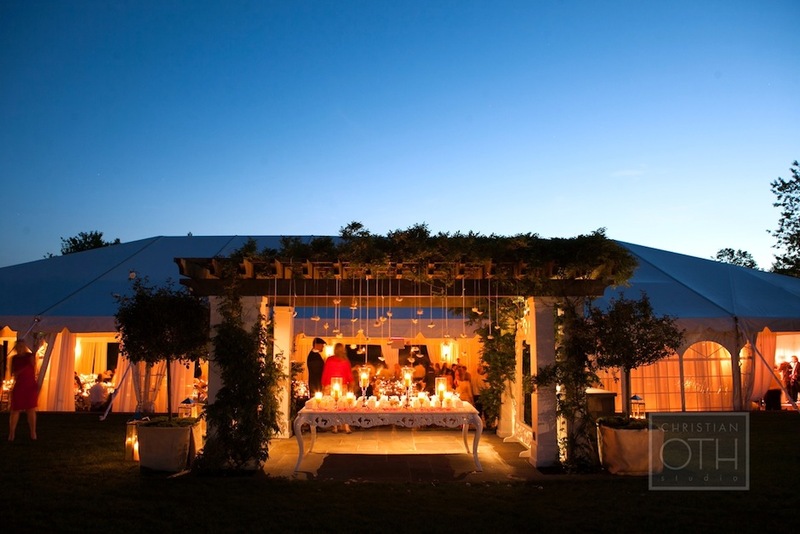 With the help of lanterns, candles, and cafe lights, you can create moments within the event that create a romantic ambiance and set the tone for a joyous evening. No matter the season, you can never have enough candles! The flickering glow of candle light creates a magic to the evening.